At Mr. Drake’s Hall on Wednesday, 25th August, the annual concert was held, in aid of the funds of St. Mary’s Church. The Rev. M. Heffernan occupied the chair. The attendance was very large and the programme good. The following ladies and gentlemen contributed items: — Misses M. Bentley, C. Ronan, V. O’Donnell, E. and M. O’Connor, and C. J. Drake, Messrs. W. Ruth, J. Herrick J. R. McDonald, and A. Brown. Mrs. W. Ruth acted as accompanist, and her playing was a feature of the programme. The manner in which the artists rendered their respective items must have been pleasing to the party who travelled from Bendigo over bad roads to entertain the residents of Axedale. Mr. W. Hawkins acted as secretary, and was ably assisted by a ladies committee, with, Misses D. Neylon and A Brown as joint secretaries. The Rev. chairman thanked all who assisted to make the concert such a social and financial success. At about five o’clock on Saturday morning, a farmer named John McNeill, residing at Weston was on his way into Sandhurst, and when crossing the bridge which spans the Campaspe, on the main road from Heathcote to Sandhurst, he noticed that the structure was on fire. He at once roused up Mounted-Constable Hayden, who is in charge ofthe Axedale police station, and informed him of the matter. The constable. hastily dressing himself, ran over to the spot, and taking in at a glance the position of affairs, and seeing that the fire had obtained a good hold on the woodwork, he sped away to the township, a few hundred yards distant, and called up the residents, ordering them to bring as many buckets and axes as they could lay hands on. Mr. J. Minter, of the Raglan Hotel took down his dray and two water tanks, and by this means a supply of water was obtained from the river. The volunteers with their buckets set to work to try and extinguish the flames, but their efforts were altogether futile as the fire had got in between the boards of which the floor of the bridge was composed. While this work was proceeding, several narrow escapes from serious accidents occurred. Several volunteers, in their eagerness to cope with the fire, rushed down the embankment under the bridge where the ashes of the debris which had accumulated there were some two or three feet deep. On top they were quite cold, but below the surface, the ashes were quite hot, and before the men could get out again their boots were somewhat scorched. While trying to get out of the ashes one of the men ran further under the bridge, when one of the burning boards from the flooring fell away, almost alongside him. Seeing that it was utterly useless to try and extinguish the fire by means of water, the men set to work and cut the timber away so as to stop the further progress of the flames. In this they were more successful, and after considerable labor they managed to keep the fire confined to about thirty or forty feet of the bridge. This portion however, was completely destroyed, as even yesterday afternoon the beams were burning away fiercely. On Saturday morning Mr. J. D. Bywater,who is a member of the M’lvor Shire Council was on his way into Sandhurst when he heard of the fire. He at once engaged a number of gangers employed on the railway to try and put the fire out, and also to place timber across the roadway so as to prevent persons with vehicles passing along there. On Saturday afternoon Mr.H. Robinson, the engineer of the shire, visited the scene of conflagration,and he expressed the opinion that it would be at least a month before any traffic could go across the bridge again, and it would be about three months before the necessary repairs could be completed. He roughly estimated the damage done at about £100. Before referring to the origin of the fire it is necessary to explain that the bridge is built of bluestone and timber. It is about 400 feet in length by 22 feet wide. There are about a dozen spans in the bridge, the abutments and piers being substantially built of bluestone, obtained at Mr. Ingham’s quarry in the vicinity. The girder, beams and supports are of red gum timber, while the hand-rails were made of softwood. The flooring consisted of two layers of thick red gum boards, covered with a coating of road metal. The bridge had to be made so long because the river at this point in time of flood is very wide; in fact, even long as the bridge is there have been times when the flood waters have risen over it. At the present time, however, the river, although pretty high, does not occupy more than four or five of the spans, leaving seven or eight spans on the McIvor side of the river, the embankment gradually descending from the eastern end of the bridge, until it reaches the water. An enormous quantity of debris has been brought down by the floods, and after the waters have receded the debris is left deposited on the embankment against the piers. This is a favorite camping ground for tramps and swagmen, and it is surmised that the fire was caused by some person who had camped there and left without putting out the ashes after him. The debris soon ignited, and the flames spread to the timber in the floor of the bridge,with the result described above. At any rate, that appears to be the popular belief amongst the residents in the locality, and it was a noticeable fact that not one even suggested the thought that it had been caused maliciously. The bridge was built by the Government some twenty-seven or more years ago, and was regarded as one of the best bridges in this part of the colony. It cost some thousands of pounds, and it was on the main road from Heathcote to Sandhurst.It was extensively used by the travelling public, particularly farmers and woodcarters doing business with this market. The loss to these people through the traffic over the bridge being stopped—as there was a large quantity of timber and produce sent in here daily—will be something considerable, and no time should be lost before a temporary bridge is erected. It would be absurd to think of cutting off the traffic at that point for two or three months. Persons living in the vicinity are naturally very anxious to have the bridge replaced as soon as possible. With the river running at its present height, it is impossible for anyone to ford it. It is rather a curious circumstance that even so early as five o’clock on Friday night different persons saw smoke coming from under the bridge, but they did not take any particular notice of the fact, surmising that, as usual some swagmen had camped there..
On Saturday morning a number of people passed over it on their way to Sandhurst, and although they noticed the smoke they did not think anything serious was the matter. Their surprise may be better imagined than described. When making their return journey home, they found the bridge was impassable. They had to either stay in the township that night or make a detour of about 10miles over bad roads to Russell’s bridge, which is about 5 miles further along the river. There is no doubt the fire, whether caused wilfully orthrough accident or negligence, originated in the debris, and the McIvor council have comein for some pretty warm expressions of condemnation for having allowed the debris to accumulate there to such an extent. At the Railway bridge, ashort distance away, men are engaged, after every flood to remove and burn the debris. Had the council adopted the same plan the present trouble would not have arisen. An investigation will probably be made to ascertain, if possible, the actual cause of the outbreak. The burning bridge was inspected by a large number of people yesterday afternoon, some of them having driven many miles. 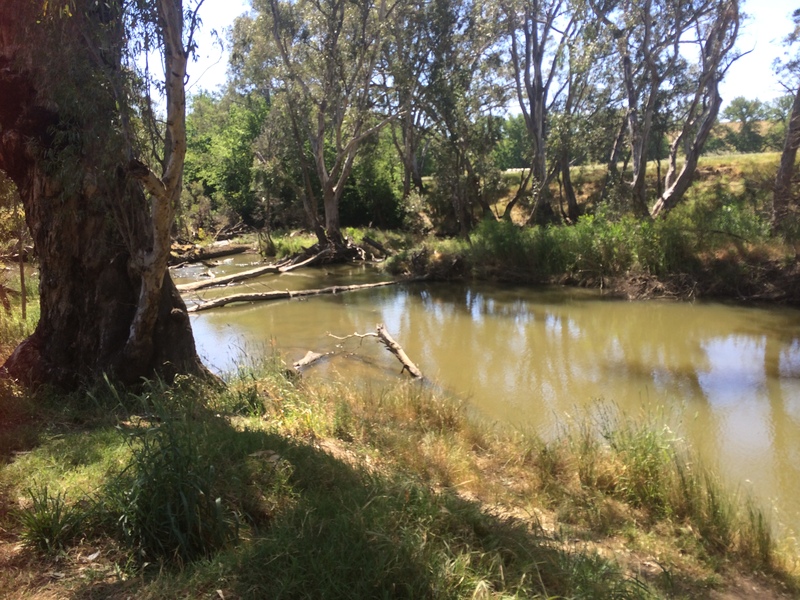 Beautiful and peaceful spot near along the Campaspe in Axedale. This is a lovely spot to walk. Axedale is in Central Victoria, about 20 kilometres east of Bendigo on the McIvor Highway. With a population of just 571 people, it definitely couldn’t be called a thriving metropolis. I would prefer to call it a peaceful, quite, tiny village, situated alongside the Campaspe river. 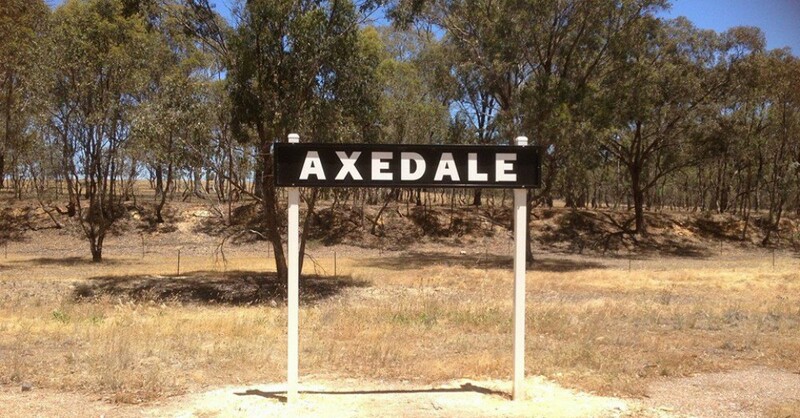 Click here to see what Wikipedia has to say about Axedale.